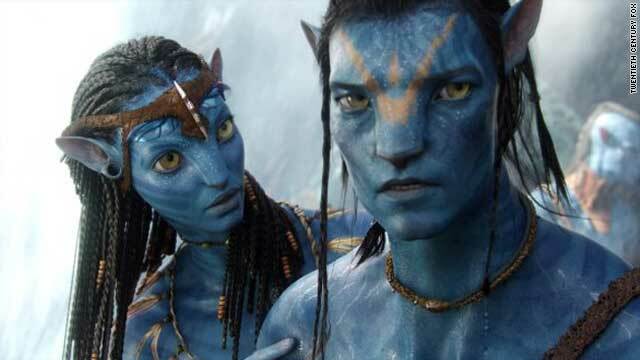 "Avatar" is James Cameron's first cinematic outing since "Titanic," the most popular film of modern times. (CNN) -- James Cameron unveiled his much-hyped, wildly-anticipated 3D sci-fi epic "Avatar" to audiences in full in London Thursday. Here's what the critics are saying about the Oscar-winner's first outing since "Titanic," the most successful film of modern times. Todd McCarthy, Variety: The King of the World sets his sights on creating another world entirely in "Avatar," and it's very much a place worth visiting. ...delivers unique spectacle, breathtaking sights, narrative excitement and an overarching anti-imperialist, back-to-nature theme that will play very well around the world..."
An epic film born entirely of Cameron's imagination, "Avatar" uses tailor-made technology to create the most astonishing visual effects yet seen on screen and blends them seamlessly into a mythical sci-fi story about an ancient alien civilization fighting the encroaching human menace. It's an unprecedented marriage of technology and storytelling which is on the whole remarkably successful. Chris Hewitt, Empire: It's been twelve years since "Titanic," but the King of the World has returned with a flawed but fantastic tour de force that, taken on its merits as a film, especially in two dimensions, warrants four stars. However, if you can wrap a pair of 3D glasses round your peepers, this becomes a transcendent, full-on five-star experience that's the closest we'll ever come to setting foot on a strange new world. Wendy Ide, The Times: "Avatar" is an overwhelming, immersive spectacle. The state-of-the-art 3D technology draws us in, but it is the vivid weirdness of Cameron's luridly imagined tropical otherworld that keeps us fascinated. At times it verges on the tacky, like a futuristic air freshener advertisement with the color contrast turned up to the max. The ethically accented orchestral score certainly doesn't help matters. But mostly, it's a place of wonder full of exotically freakish animal composites -- iridescent lizard birds, hammer-headed rhinos -- and sentient vegetation. "Avatar:" We shouldn't really be telling you this -- but it's good. Mark Brown, The Guardian: Perhaps most surprising was the politics. At one stage the deranged general leading the attack, with echoes of George Bush, declares: "Our survival relies on pre-emptive action. We will fight terror with terror." Will James Cameron's 3D 'Avatar' change cinema forever?